Hey, have you entered the interactive contest from last post yet? No? Whatcha waiting for. Head here to enter. It’s fast, fun & easy. Liz Paterson, an intern with UN-Habitat here in Nairobi, knows a thing or two about small, quick elephants. The Heath brothers, in their fabulous book Switch – how to change things when change is hard – write about how we all have elephants a.k.a. our feelings & motivations to do with a change. Rather than solely addressing facts, logic & information when we’re trying to change something, it’s more effective to deal with our elephants. When I work with clients, I specifically encourage them to find their quick, small elephants. Translation: look for a couple of small things you can do easily & quickly that will help motivate people towards embracing a change. Which, is exactly what Liz Paterson did recently. 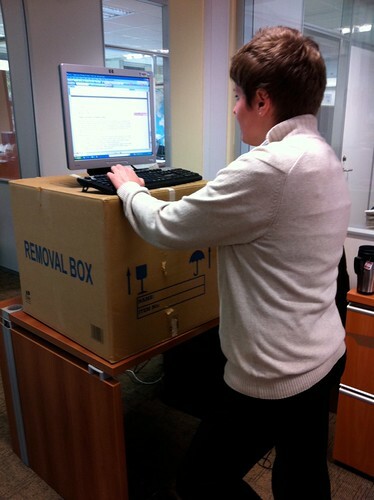 Liz, who is on her way to getting a Masters in Public Health, says that sitting is the new smoking. 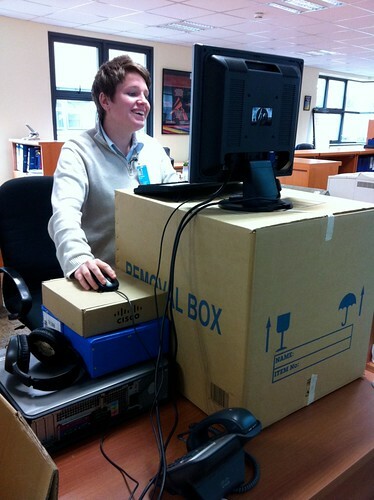 That’s why, when she arrived in her U.N. office, she promptly put a large cardboard box under her computer, which gets her standing for several hours a day. Yes, a large cardboard box. Turns out too, that other interns have followed. 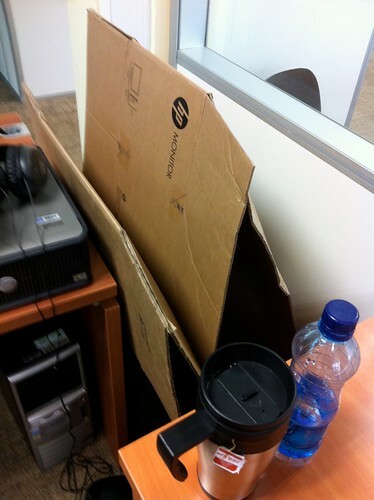 If you were to walk down the hallway with open offices near Liz’s desk, you’d see a number of large cardboard boxes under others’ computers. So what did Liz do that made for quick, easy elephants? Trying to change something? Look to Liz for inspiration & find your own quick, small elephants.